Many artists of note have “stand-out” works – paintings, drawings or other works that rise to the top of their oeuvre and serve as the work associated with their name. Hans Holbein the Younger’s The Ambassadors not only fits that distinction, but stands out as one of the most enigmatic and unusual paintings in the history of art. 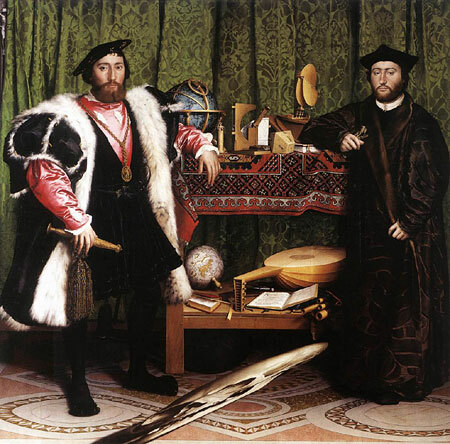 As I pointed out in my recent post on Holbein, The Ambassadors, the full title of which is actually Allegorical Portrait of Jean de Dinteville and Georges de Selve, is a painting worthy of discussion all on its own. It is joint portrait, in itself unusual, most portraits are either a single individual or a group. Is presents two highborn French men, Jean de Dinteville (left), ambassador to England and Georges de Selve, Bishop of Lavur and ambassador to the Venetian Empire and the Holy See. The two were friends and are shown with a complex still life of objects in some ways related to their pursuits, a globe, an astrolabe, a sextant, a lute (with a broken string) and a math book, among others. All of them undoubtedly have their allegorical meaning within the context of Holbein’s intention for the image, but exactly what that intention is remains a matter of debate. The most interesting object in the painting, however, is an elongated, indistinct object that seems to float in the foreground, just above the floor and in front of the subjects of the double portrait. When seen from a certain angle it becomes clear that this is an anamorphic image of a human skull. An anamorphosis is an image that is distorted in such a way that it only assumes the proportions of a recognizable image when viewed from a certain angle, or by reflection in a curved surface. Anamorphic images have a long history in art and have been in the public eye in recent years because of their use in the startling sidewalk art of Julian Beever and Kurt Wenner. The image of the skull in The Ambassadors is only visible as a skull when viewed from below and to one side of the painting. It has been suggested that it was meant to be displayed above a staircase, so that those climbing the stairs would be startled by the apparition of the skull as they glanced upward at the painting. You can see a photographic restoration of the skull image as seen from that angle here. The painting has been the subject of much speculation, both for the anamorphic skull and the meaning of the various objects arrayed behind and in the hands of the subjects. There are interesting essays here, here and here. There is a list of links on the site of the Department of Mathematics of the National University of Singapore and a short essay on the skull, and other features of the painting on the site of The National Gallery in London, which is where the painting resides. There are even books devoted entirely to the painting, like Holbein’s “Ambassadors”: Making and Meaning (National Gallery London Publications) by Susan Foister, Ashok Roy, Martin Wyld (additional info here), and Holbein’s “Ambassadors,”: The picture and the men by Mary F. S Hervey. There in no mention of the painting in Holbein’s extensive records of his major works, yet it is his largest work and the only painting he signed and dated (1533). It was apparently lost from view for for most of the years since it was created until it was “re-dscovererd” by an art historian in the late 19th century. Symbolic, enigmatic, and masterfully painted, Holbein’s The Ambassadors is certainly a “stand-out” work. I’ve always been a little surprised that he didn’t seek out a way to more organically integrate the skull shape into the composition as seen head-on, which makes me wonder if he added it at a later date. What’s striking is that when viewed at the point where the skull resolves to it’s proper shape, it appears to have roughly the same scale as the heads of the ambassadors – print out the image and try it! I saw a TV show a couple of years ago where this painting featured. The show was about how a lot of old painters (Caravaggio for instance) used lenses to project the scene they were painting on the canvas. They claimed that the skull in “The Ambassadors” must have been projected on a slanting canvas. It was an interesting show. The painting of the Ambassadors was originally displayed at the top of a stairway and the skull would have appeared “norma;” to viewers coming up the stairs. When in front of the painting it takes it slanted shape while the rest of the painting appears normal. There’s a very interesting fictional re-creation of Holbein’s process of creating this painting in the historical novel “Portrait of an Unknown Woman” by Vanora Bennett, about Thomas More’s family, particularly his adopted daughter Meg Giggs, and their relationship with Holbein. I too have greatly enjoyed the book “Portrait of an Unknown Woman”, have enjoyed constantly referring back to the paintings on this website. I have now listened to Vanora Bennett’s book on CD (came as a set of 12 disks) twice. That lead me to do a little more research into Holbein. I found it fascinating and credit her work with jump-starting the interest I once had in Art History and History. To see the pictures of Holbeins work certainly brings it all to a better focus.